Our daughter, Gracie, was born in November of 2010 with Down syndrome and very complex heart defect. Despite doing everything we could do for her, Gracie passed away at 17 months old. We knew we could never replace Gracie, but we also knew that our family was prepared for and eager to raise a child with Down syndrome. We had always known about the National Down Syndrome Adoption Network because we had always talked about - someday - adopting a child with Down syndrome. 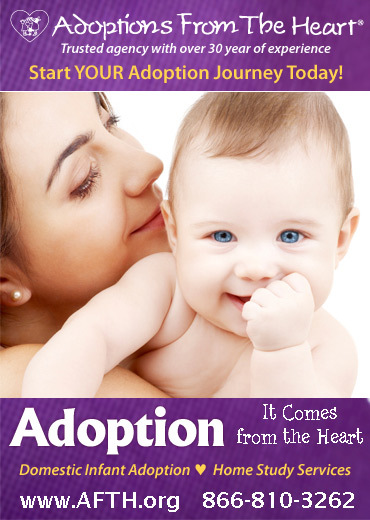 When we were ready, we found an adoption agency in our area and got the home study completed. It was time consuming, but we got everything done and were eager to get on the "list" of waiting families. We were put on the list right away and we were excited and anxious. When birth parents contact the NDSAN because they are looking to place a child for adoption, they are asked about the type of family they are looking for to parent their child. From those wishes, a set of potential adoptive parents is found - usually 4 or 5 families - and the birth parents can choose from that set - or request more choices. The potential adoptive families are always notified and asked if they want to be "presented" to the birth families. It is a tough process because you get excited each time about the possibility of this being your baby! Some of the birth parents had a prenatal diagnosis and the baby was not born yet and some received a birth diagnosis and the baby was already born. We got called 8 times for possible matches before finding our sweet Olivia. After receiving the news that we had not been chosen to parent baby number 8, we were so sad and disappointed. Stephanie at NDSAN reassured us that when it is right, it will happen. And she was SO right. The day after we were disappointed about not being matched with baby number 8, we got a call from Stephanie. We could HEAR the tears in her eyes over the phone. "This is your baby!" she said. It was OUR baby. We talked to Stephanie Sunday afternoon and Monday evening we were in Tennessee to meet our sweet Olivia. She is the sweetest, happiest, most laid-back baby we could have asked for - perfect for our family. She was worth every minute of the wait and every ounce of disappointment. We would never have found our perfect baby with the help and support of NDSAN. We are eternally grateful!